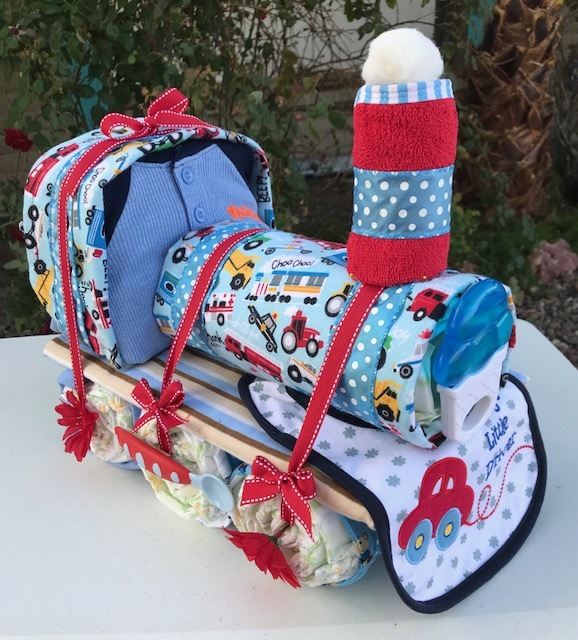 This large locomotive train is made with1 handmade blanket 35" x 41", 1 handmade matching burp cloth 8-1/2" x 18", 1 store-bought flannel blanket 28" x 28", 1 store-bought burp cloth, 53 Size 2 diapers with a wetness indicator, 1 baby bib, 1 baby fork & spoon set , 1 washcloth, 1 BPA free bottle, 1 BPA free teether or pacifier and 3 onesies. The train is 13 inches tall (at smokestack) x 9 inches wide x 15 inches long.. Everything is new but taken out of original packaging. Patterns of materials will vary due to availability. Selection is Designer's Choice. Customization is an additional charge. Shipping is $ 60 and up (depending on the zip code where it is being mailed to, weight and mailing box size) not $7.50 as shown in cart. This is also available for local pickup in Phoenix, Arizona. It will be the hit of the baby shower!